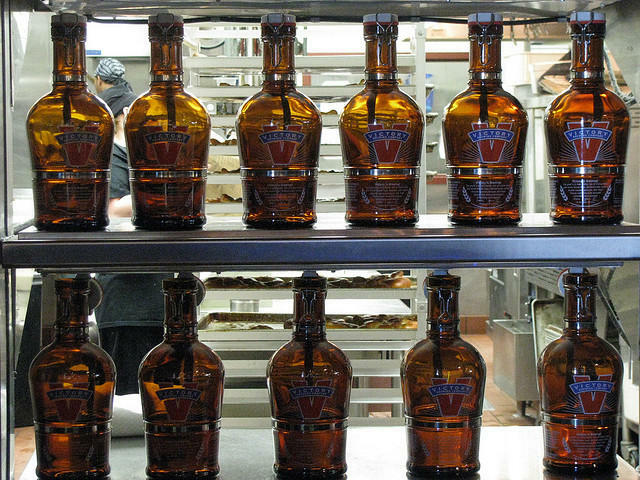 This July brought changes to Florida’s craft distilling industry. New laws loosened regulations to allow more flexibility in person-to-person sales. But some distillers hope those changes are just the first step. In a second floor office of a warehouse that used to produce electricity and store ice for St. Augustine’s, Phil McDaniel is rooting through a small cabinet. McDaniels is the head of St. Augustine distillery. “We’ve been in the planning stages for five years we’ve been in operations and open to the public since march of 2014—so a little over 18 months,” he says. The distillery is probably best known for vodka, but they make gin, rum and their first batch of bourbon is stacked up 6 barrels high in the warehouse. 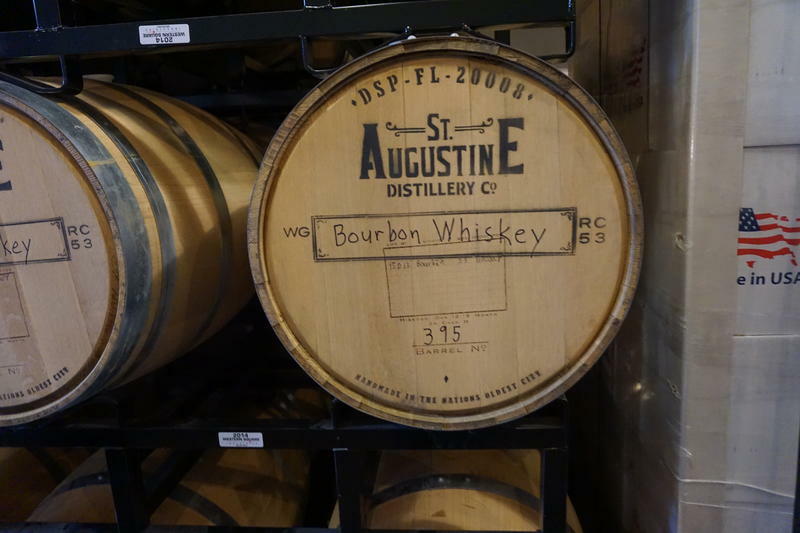 That may sound like a lot of booze—and it is—but compared to some operations, St. Augustine is tiny. Take the bottling process. Instead of those mammoth conveyor systems that crank out a couple million cans of beer a day, the distillery has Leighann Howland. She’s bottling gin, six at a time, and the entire process—from empty bottle to labeled, sealed product—happens on a single table, maybe six feet long. Beer and wine are bigger industries and tend to get more attention in state politics. But McDaniel says distillers notched a big win earlier this year. Before that the limit was two bottles per person per year. “And now with this new law change we can sell two bottles of gin, two bottles of vodka, two bottles of rum,” McDaniel says. He says his business is already noticing the impact, and he wants to boost direct sales even more. “Our sales have been up 15 percent or maybe even 18 percent as a result since July 1 and that’s significant,” McDaniel says. Making that case could prove difficult. McDaniel is hoping to eventually remove any limit on in-person sales, but he and other distillers are likely to face significant push back from those partners in the distribution and retail industries. Florida regulates alcohol by forcing it through a three-tier system where producers sell to distributors, who then sell to retailers. Although McDaniel’s sales today may in fact boost business for the other tiers down the road, those other tiers are typically more concerned about the money they’re losing today. The conflict has played out in heated exchanges at the Capitol. During the most recent round of committee meetings, Rep. Halsey Beshears (R-Monticello)— chair of the House Business and Professions subcommittee—warned his members they’re likely be in for more of the same in the coming year. “Matter of fact if I were a betting man, I’d bet on it,” he finished. Those contentious measures could include proposals for powdered alcohol and the so-called “Whiskey and Wheaties” bill aimed at allowing grocers to sell alcohol without setting up a separate store. But it’s likely they’ll also revisit bottle restrictions. Rep. Greg Steube (R-Sarasota) is sponsoring the bill. Steube filed that measure late last month. If McDaniel gets his way, it will take effect next July. Small-scale beer and spirit producers are seeing more opportunities for growth and exposure. The Florida Legislature may be at odds over Medicaid expansion, but at least it agrees on the long-awaited growler. The House approved the measure Friday. The state's record-setting budget goes into effect on Wednesday, along with 130 other new laws that were produced by the Legislature this year in the regular and special sessions and signed by Gov. Rick Scott. Starting Wednesday, the state will no long collect sales tax on gun club memberships, people with 64-ounce beer containers known as "growlers" can get them filled at breweries, and governments in Florida will have to start looking to buy American-made U.S. flags.